Dr. Janice Armstrong, aka Dr. Jai, is the CEO and Founder of LiHK Consulting, LLC. She completed her doctoral studies at Regent University in the field of Strategic Leadership, obtaining a Doctor of Strategic Leadership degree and a Leadership Coach certification. She also has a Master’s degree in Counseling Psychology. She specializes in transition coaching, which prepares clients for various changes and milestones in their lives. She guides the clients via training and development activities to make a possibly stressful change, more comfortable. She also encourages clients to be the leaders of their own lives – to own the direction and to accept or change the results. Dr. Armstrong has worked for government agencies, in the Baltimore, MD and Washington, D.C. areas, in the following positions: Vocational and Educational Specialist, Training Specialist, Leadership Development Program Manager and Management Analyst. She is also an Adjunct Professor, teaching courses in behavioral science. She provides a wealth of personal and professional development information that has been built over 18 years of training, professional, and organizational development experience. Senior leaders have received her multigenerational, charismatic approach to training development very well. Her platform for motivational speaking surrounds H.I.P. H.O.P., an acronym for “Having the Inner Power to Hone Our Purpose”. This developed from her roots in urban and pop culture as well as her experience in media. She has been an on-air personality with WERQ-FM (Baltimore, MD) and has made guest appearances, offering expert commentary, with WHUR-FM and WKYS-FM (Washington, DC) as well as Survival Radio Network (Atlanta, GA). Dr. Jai is a featured speaker for the Marathon of Excellence and the Sensational Speakers Syndicate, a life development series and speakers’ forum created by “The Basement Crew”, George Fraser of FraserNet and the PowerNetworking Group. 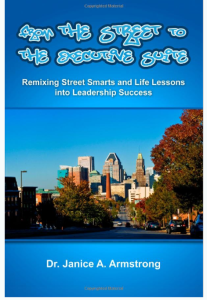 Dr. Jai is also an author of several published articles, blog post contributions, and her book called, “From the Street to the Executive Suite: Remixing Street Smarts and Life Lessons into Leadership Success”. Dr. Jai is interested in fostering professional growth and development in youth and adults. She has addressed students, teachers and professors in the Baltimore City School System, Top Teens of America, the McNair Scholars’ Program, Prince George’s Community College and the University of Maryland Baltimore County, to name a few. She has launched her leadership development program for youth and young adults, entitled, “Dr. Jai’s LeadersHIP HOPportunity Program”, that teaches leadership development, utilizing Hip Hop history as a learning tool. Additionally, she is a college success expert, sharing experiences as a student, administrator, and director in various college positions. She desires to help students “crush collegiate captivity” through teaching essential skills in school/work-life balance, so that they truly enjoy their college and young adult experiences. Her organizational development focus is to teach others how to work efficiently in a multi-generational workforce. Her background in counseling psychology and leadership development fostered her love for leadership and lifestyle coaching. She encourages people to “discover what they LiHK (like)…” in order to “become who they love”. Dr. Jai would love to meet with you to discuss how she can meet your training, coaching and/or speaking needs.